Engineers from the Virginia Polytechnic Institute and State University (VT) have found a way to 3D print piezoelectric materials, which convert mechanical energy into electric current. Piezoelectric materials produce an electrical current when stress is applied. For example, if a piezoelectric film is connected to a small LED light, tapping the film (mechanical stress) with one’s finger will turn the LED on and off (electric current). This also works in the opposite direction i.e. when the electric current is applied to the piezoelectric film, it changes its shape up to 4%. Piezoelectric materials can be found in nature such as the mineral quartz and topaz, and bones, or can be synthesized. Such materials have wide applications in sensor technology and can also be used as actuators in soft robotics. One of the most popular applications of piezoelectric materials is in cigarette lighters, which ignite a flame when a spring hammer hits a piezoelectric crystal. More varied applications of these materials are also being explored, like the piezoelectric floor mat in a Japanese train station, used to produce electricity for the station. In the recent paper titled three-dimensional printing of piezoelectric materials with designed anisotropy and directional response, the researchers were able to make a 3D printable ink from lead zirconate titanate, a piezoelectric ceramic. This ink was then used to print various complex piezoelectric structures with a DLP printer. 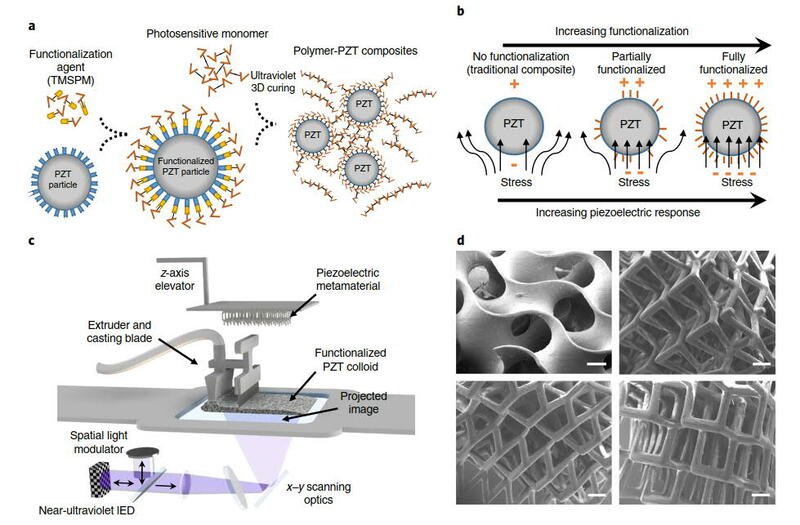 The 3D printing process of the piezoelectric ink. The image on the right shows the microstructure of the material. Image via Springer Nature. Piezoelectric devices are generally made using conventional manufacturing techniques such as silicon mold processing and powder injection molding. Sometimes devices are made using piezoelectric films. However, these processes have limits on what shapes can be achieved. 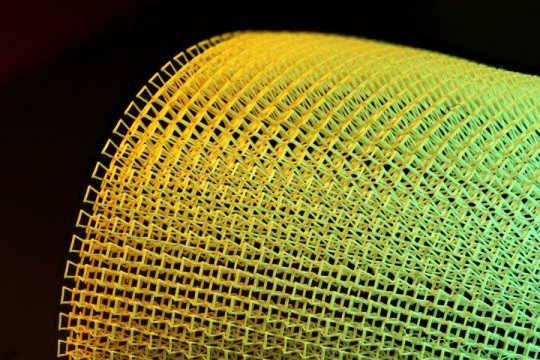 Whereas, 3D printing, in general, is capable of creating complex shapes (like lattice structures) with much greater ease than other manufacturing methods. Now with the possibility of 3D printing piezoelectric materials “We can tailor the architecture to make them more flexible and use them, for instance, as energy harvesting devices, wrapping them around any arbitrary curvature” Zheng said. Control over the shape of piezoelectric materials also extends their sphere of applications. Furthermore, the team also discovered that some microstructures can convert energy more efficiently than others. A 3D printed flexible sheet of piezoelectric material. Image via Virginia Tech. Nominations for 3D Printing Industry Awards 2019 are open now. Visit the nominations page to name the academic team of the year. For more news on the latest research in additive manufacturing subscribe to our 3D printing newsletter. You can also join us on Facebook and Twitter for live updates. We also have great careers in 3D printing, see our 3D Printing Jobs board for more information and keep an eye on our jobs articles. Featured image shows a 3D printed flexible sheet of piezoelectric material. Image via Virginia Tech.